CNN reported this week that the Republicans used coded messages in Twitter accounts to get around campaign finance laws which prohibit coordination between campaigns and outside groups such as Super-PAC’s. Information in fake Twitter accounts allegedly contained internal polling data. Republican officials deny knowing abut this. Considering the wide range of things which Republican officials know nothing about, including science, math, economics, ethics, the workings of a democratic nation, and most human knowledge acquired since the enlightenment, Republican claims of not knowing something are very difficult to dispute. 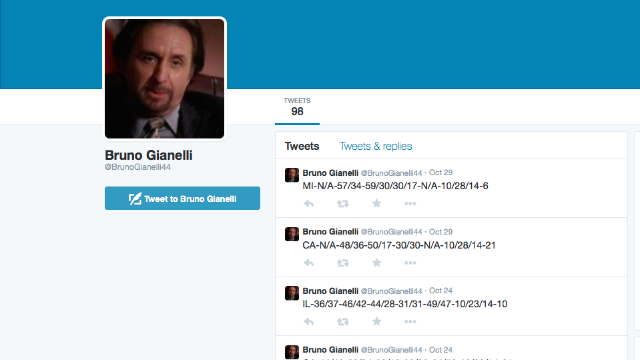 The screen grab from one Twitter account used, which has since been deleted, was under the name of Bruno Gianelli. Bruno Ginnelli worked as Jed Bartlet’s campaign manager in 2002. It shouldn’t be too surprising that Gianelli is now working with the Republicans as he did work as a consult to Arnold Vinick’s GOP presidential campaign in 2006. Some might find it surprising that Republicans did watch The West Wing. I’m sure they draw the line at watching MSNBC.